The Pizza Files: Pizza Files 2010 Summer Binge, Stop Seventeen. For the last stop on the Binge 2010 I wanted to visit someplace new to me. I had a plan to get lunch from Francesco Pizza in St Peters, just down the road from where I work. I told my fellow pizza eaters (co-workers) if they would order and pick-up the pizza I would buy. After much trying to reach Francesco's to no avail, my fellow pizza eater decided to drive there and order our pizza. She found the doors locked... So my fellow pizza eater recommended Stefanian's Pizza. I had never been to Stefanian's so I said sure. 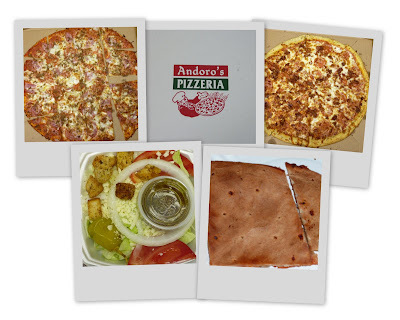 Well it turns out the location my fellow pizza eater was thinking about was actually Andoro's Pizzeria... I had Andoro's last year and wasn't to impressed, but it was getting late and I was hungry so I said "sounds good to me". That's how Andoro's Pizzeria became stop seventeen on the 2010 Binge. Having been there and done that before I choose to get a thin crust (St Louis style) with mozzarella cheese and the rest of my favorite toppings (pepperoni, Canadian bacon, hamburger and onions). My fellow pizza eaters got a thick crust pepperoni and bacon. I also got a side salad with the house dressing. My pizza and the salad were good. As with my prevouis visit the thick crust pizza was just not up to par. If you just got to eat at Andoro's I suggest you go with the thin crust and mozzarella cheese.